TeamTec original sludge oil tanks ensure an ultimate and safe operation of the incinerators unit. Tanks are delivered in sizes from 435L NET to 3000L NET. All TeamTec sludge oil tanks are complete with heating coil, sludge circulation pump, high and low level switches, and required safety/operational valves. The tanks can be delivered for heating with steam, electricity or by thermal oil heating (superheated water upon special request). With steam, the energy consumption is estimated to 50 kg/hr at 7 bar. Heating by electricity requires 12kW or 16 kW, depending on tank size. 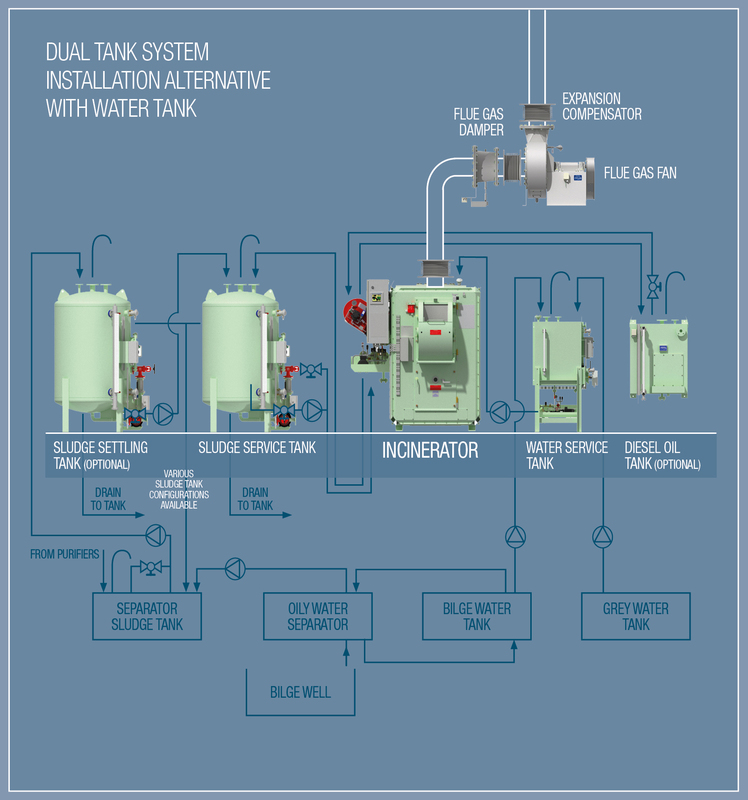 One tank is used for settling and the second one is the service tank for consumption. For other situations, a single tank system usually works fine. When deciding the capacity for the sludge oil tank(s) TeamTec recommend to choose a tank with a capacity of minimum 2% of the daily bunker consumption (e.g. 40 t/day HFO = minimum 800L NET). The sludge tank(s) and incinerator should ideally be installed at same elevation, at the maximum one (1) deck above the incinerator or two (2) deck below.. If the client would rather use another tank available, we still need to functionally integrate this with the incinerator. It is very important to be able to drain water, and to heat and mix the sludge before incineration. TeamTec has different packages for steam, electrical or thermal oil heated tanks. Included in the packages are a sludge circulation pump (required), a control panel and a number of fittings and electronic components. All valves required by class are included.